We’ve replaced our manual installation process with a wizard-based installer and this simplified installation guide. If you run into any errors or problems while installing Memberium, you can refer to our troubleshooting guide to find a potential solution. If the troubleshooting section doesn’t help solve your issue, or if you feel like you want help at anytime, our support team is standing by to help you. If you submit a ticket for assistance, please be sure to include all the requested information so we can get started on your ticket right away. The number one delay in ticket service is incomplete or wrong information. Most people with even a little bit of WordPress experience can run the Wizard installer without any of the instructions below. The installer link should download a zip file. You can then install the zip file into your WordPress site like any other plugin. Don’t bother keeping the installer around between projects. As we update it you’ll miss out on new features and improvements if you keep the old one around. Typically the only benefit to doing the manual process, is if WordPress cannot write to your plugin directory. The Wizard simply automates the manual steps that we would normally perform for you, it doesn’t limit your options or skip over any controls. 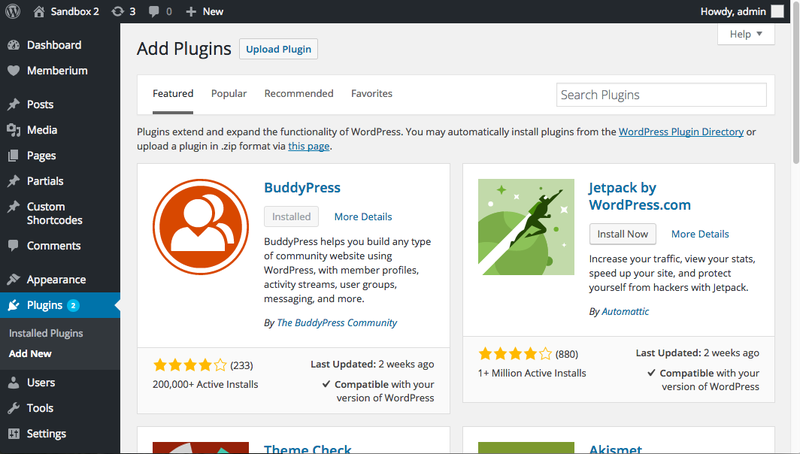 You can install plugins directly from the admin area. Download the plugin to your computer, then log in to your WP admin area and go to Plugins > Add New. Click the “Choose File” button in the middle of the screen, and select your zip file from your machine. Then click “Install Now” to install the plugin. When the plugin installs, you’ll see a link to Activate the plugin. Click this link, and the plugin will automatically start running. This guide is intended for orientation. The wording on the plugin screens may change slightly from these screenshots. The process will remain the same. If there is additional wording on the pages that doesn’t appear in these screenshots, just note and follow those instructions. If there is a problem detected, the plugin will let you know in clear language and prompt you to contact support. The Wizard always downloads the most recent version of Memberium and the i2SDK so you don’t have to worry about that. Always Fresh! Never Frozen! The welcome screen has a short introduction video and some welcome text. Once you watch the video, click the blue “Get Started” button. Next, the installer will check over your server setup and make sure that the basic pieces are in place that Memberium needs to operate. This doesn’t guarantee that there won’t be problems, but it does cover the most common situations we run into. If the plugin detects a problem, it will display that item in red. Green items mean everything is OK. If you don’t see everything on this screen that we see, that’s OK too. 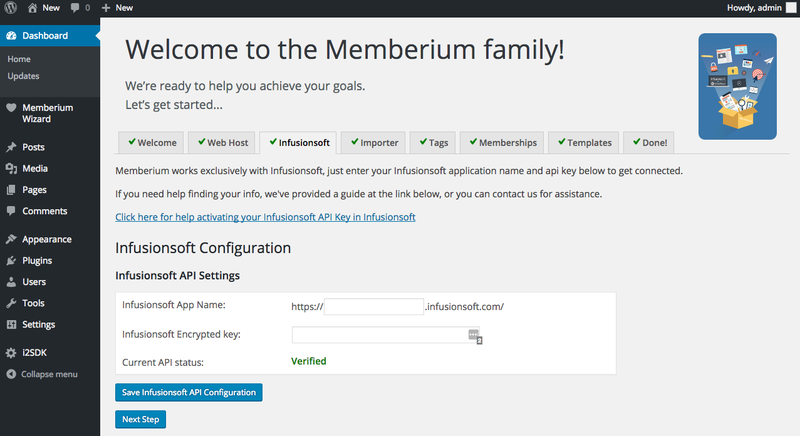 Next enter your Infusionsoft app name and API key into the wizard configuration page. If you’re not sure where to find your API key, click the link on the page to read our short tutorial. Once you enter your app name and API key and click the button, the Wizard will verify your information and let you proceed to the next page. Don’t panic if you see your information already filled out. If you have previously entered your API information into another WordPress plugin, the Wizard will try t find it and auto-fill it for you. 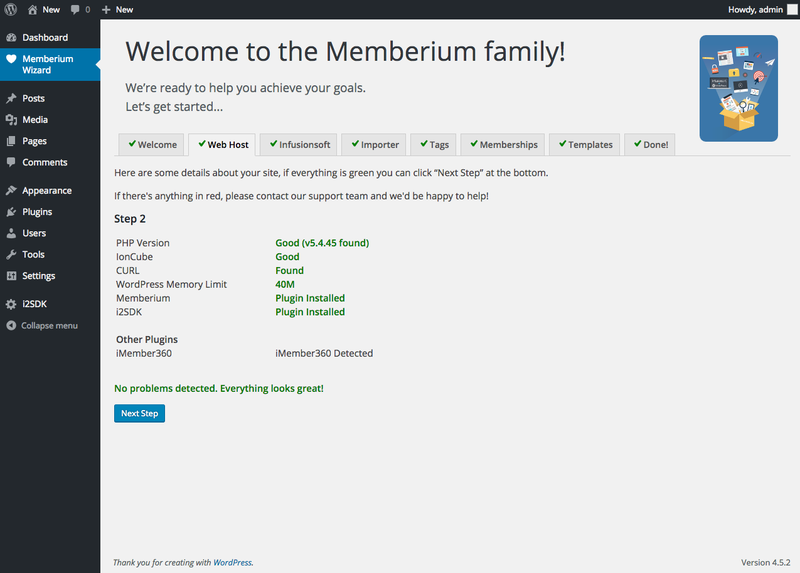 If you are upgrading from another membership plugin, Memberium may find settings that it can import. Depending on what Memberium finds, if you wish to import your old settings, follow the on-screen prompts to import your old settings. 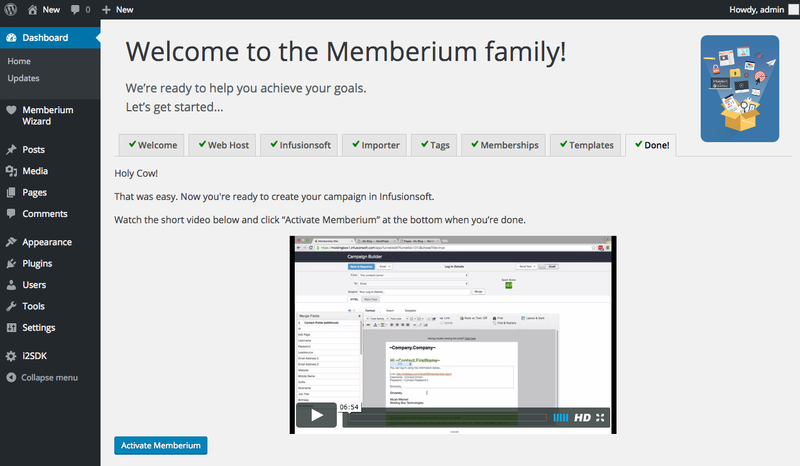 Next, select the tag category where Memberium will install any membership tags that you create in the next step. If you imported any memberships in the previous step, those tags will stay where they’re at. Choose your tag category, and click the blue “Set Category” button to continue. If the membership level you want to create is a Subscription (recurring payments) click the checkbox when you create your membership level. This will create some extra tags that may be useful for managing subscriptions. If you make a mistake don’t worry, you can always create the tags later in Memberium. 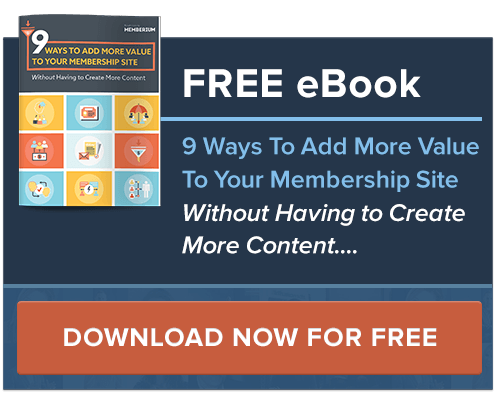 If you’ve previously created any membership levels or imported membership levels from another plugin, those membership levels will appear at the bottom of the page. If you want to delete any pre-existing membership levels, you can’t do that in the Wizard, but you’ll be able to do that as soon as you launch Memberium itself. Click the blue “Next Section” button when you’re ready. 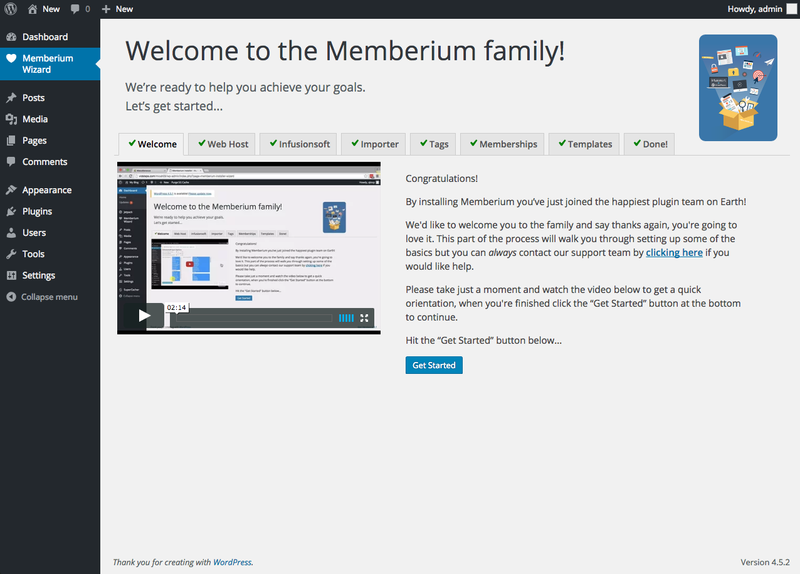 Memberium comes with some sample templates to help you plan and implement your site. These are not designed pretty page templates, but content templates to help create the skeleton of your site. You can install these templates on your page. The Wizard will helpfully load them and save them on your site in draft mode so they don’t clutter up your pages. You can use these pages as is, add design to them to match your look and feel, just reference them, or delete them altogether. No puppies were harmed in the making of these templates. In the words of an immortal sage lost to time, “HOLY COW! That Was Easy.”. The last screen has a video and another welcome message, and a button to finish the Wizard and activate Memberium.